I found that working on my own was becoming quite detrimental to my productivity, especially when I work from home. I started to use a time management method called the Pomodoro Technique . This uses a timer to break down tasks into 25-minute intervals, followed by a short break. However, having to constantly reset my iPhone timer became quite annoying, so I looked for an app to help out. I use two main functions on the app. The first is the timer, which can be set to your choice of time intervals. You can set sounds to indicate the end of the work interval and the end of each break. The breaks also give me a good opportunity to stretch and refocus my attention ready for the next section of work time. The second function I use is the reports. 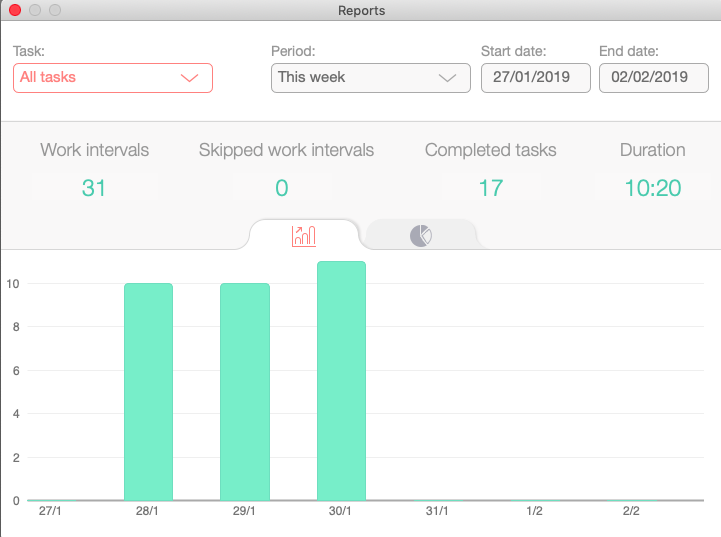 This is so interesting as I’m able to see how many intervals of work I completed (you can set your target amount per day). The pie chart (not pictured) also shows a breakdown of how much time I’ve spent on each task, so I can check in on my productivity for a custom time period, whether that is one day, a week, one month or a year. It’s been amazing in terms of keeping my focus and productivity on track for the last six months and using the timer is now firmly embedded in my daily routine. I like being able to tick tasks off as I complete them too. The pro version works brilliantly for me because it syncs with Focus Matrix, another productivity tool which I will share in my next business tips blog. However, there is a free version of Be Focused. I started by using the free version initially. If you just want the timer, then the free version works really well.